That I am of Chinese decent might make one imagine that I could never enjoy a performance of the Beatles if my parents objected. Of course this thought assumes that Chinese children always adhere to the commands of their parents. I don't want to appear disrespectful, but I must admit that when it comes to music, my range of appreciation differs from my father's. Actually, my father while suggesting that rock n roll is pretty awful, will also express annoyance with "long hair music" in the next breath. (This may confuse those people who associate long pigtails with the older generation Chinese). Hence, my father's musical taste is hard to classify. I don't see any difference in music as long as it satisfies me. True, rock n roll cannot equal Chinese music in delicate tonal combinations, but what music equals the hypnotic beat of rock n roll -- especially that produced by Ringo Starr? Really I cannot be accused of being a rock n roll fanatic. I only enjoy it when my mood calls for excitement and movement. What better way to be awaken from the humdrum of life's slow pace than with a quicken rock n roll beat. 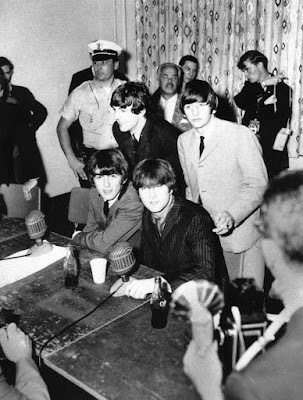 My belief that Beatle music is not bad was confirmed when I met the Beatles in person at a backstage press conference and saw their show in Atlantic City. To reassure parent, these fellows put on a fine. wholesome show for teenagers. And for the interview they were nattily dressed in black, velvet trimmed no collar suits. After bouncing in front of the room and waving and calling "Hi everybody!" in their familiar "A Hard Day's night" fashion, they settled down for pictures and questions. "What do you intend to do for the next few years?" Said George with a slight grin, "We never plan -- it all happens." "What do each of you miss from your former way of living?" Paul answered, "Going on buses." Said George "Having nothing to do." John missed school and Ringo missed going to the movies. "When will you make your next movie?" they were asked. They told us it was planned for February of next year (I guess these fellows do plan). "How many rings do you have Ringo?" He answered "about 100" and he said he hardly has enough fingers for all of them.